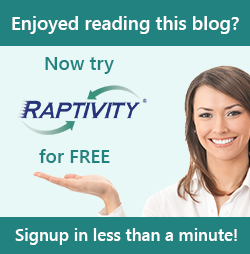 Raptivity Team would like to extend a very warm thank you for sharing your time with us by participating enthus iastically for the launch webinar of Raptivity v7.0 organized on 6th March, 2012. The theme for the webinar was “Get started with HTML5 using Raptivity Interactions”. It was conducted in three different time zones catering to eLearning enthusiasts from three continents viz; USA, Europe and Australia. The interactive session was all about mobile learning and specifically the HTML5 capabilities of Raptivity. The webinar attracted a good number of industry professionals which made the ‘question hour’ session very interactive. The webinar started off with a poll and the results were an eye opener. The results of the poll will be shared soon in the next week’s follow-up blog. The figure 1 listed below is a snapshot of the poll question asked during the webinar. Figure 1. Poll Question Many crucial topics related to mobile learning were discussed such as benefits of including interaction in mLearning, definition and comparison of three common outputs of mLearning, etc. A brief overview of Raptivity features along with the HTML5 publishing was demonstrated during the webinar. A sample course that was built with Raptivity Essential HTML5 interactions was also showcased which captivated the audience. Finally, the session was wrapped up by sharing information on how one can get HTML5 interaction templates in their eLearning toolkit. This was followed up by an interactive Q&A session where numerous queries from the audience were aptly answered by the hosts. If you have missed the action, don’t worry as we have recorded the webinar for your offline viewing. You can also write to us at info@raptivity.com for your queries regarding Raptivity HTML5 templates. How to Design an E-Learning Course?